Offshore wind farms generate energy from the raw winds out at sea. But the salty air causes them to rust. For such plants to be profitable, they have to re- main in service for at least 25 years – which is impossible without regular maintenance. In the future, the use of innovative materials and technologies will make this task less onerous and cheaper. Fraunhofer researchers are developing a protective film that will optimise the repair process and are working on the necessary inspection criteria. The energy transition is in full swing, and more and more wind parks are being constructed offshore. Many new projects are underway in the North Sea and Baltic Ocean. But the maintenance and repair of these structures presents numerous difficulties, not least because the turbines are anchored in the seabed and cannot be towed to a dry dock for maintenance like a floating oil platform. Everything has to be done on site, out at sea, whatever the meteorological conditions. This task is particularly difficult when it comes to renewing corrosion-resistant coatings. New solutions being developed by researchers as part of the collaborative RepaKorr project will make this easier in the future. “Our aim is to develop a holistic, sustainable concept for the maintenance and repair of protective systems, that will be simpler to apply and thereby reduce costs,” explains Peter Plagemann of the Fraunhofer Institute for Manufacturing Technology and Advanced Materials IFAM in Bremen. 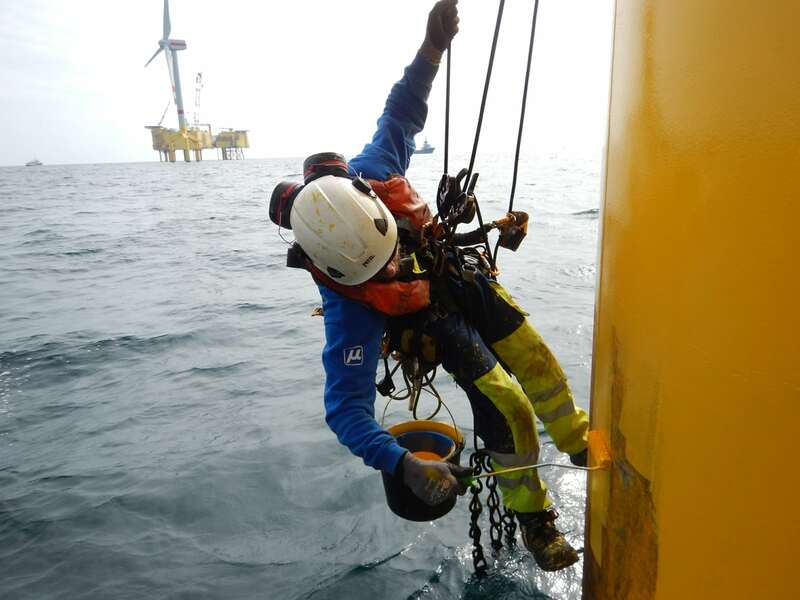 The all-round inspection and repair solution to increase the corrosion resistance of offshore wind farms is set to be ready for implementation by March 2016. It places special emphasis on those parts of a wind turbine that are not permanently submerged under water, and therefore need a particularly hard-wearing coating to prevent the formation of rust. The main contributors to the project are Sika Deutschland GmbH, which is developing new repair materials, and Muehlhan AG, which is developing novel application and analysis methods. This work is being complemented by the development of new testing concepts; current guidelines and methods are not adapted to the testing of repaired components. “There is a need for standard procedures that can be used to verify the quality of repairs,” says Plagemann. Because such guidelines do not exist at present, the IFAM researchers have devised tests based on their own criteria. Another project partner, AirRobot GmbH, is investigating the idea of using drones to inspect coatings and determine what repairs are needed. Here, too, clear inspection criteria must be defined so that this process can be automated as far as possible. Until now, this job has been done by workers wearing climbing harnesses – a time-consuming and dangerous activity. The IFAM researchers are developing a protective film to prevent moisture and salt from coming into contact with surfaces that have been cleaned and prepared for recoating until such time as the actual repair coating is applied. “The challenge is that the film must adhere firmly and yet be easy to remove without leaving any residue. We’re trying to find a solution that combines these seemingly contradictory requirements,” says Plagemann. The Fraunhofer researchers are pursuing two ideas, one of which has been tested successfully in the laboratory. The other is in the process of being patented. “The positive effect of this protective film,” says Plagemann, “is that it allows the repair process to be carried out more cost-effectively, because the critical period between preparing the surface and applying the coating can be planned much more reliably.” This is a significant factor, given that the cost of maintaining and repairing offshore wind farms can easily add up to one hundred times the original construction cost over the years of operation. Whereas the metallic coating of onshore plants generally costs around 20 to 30 euros per square meter, the price can rise to several thousand euros for offshore plants. The RepaKorr project aims to considerably reduce these costs. The project partners intend to standardise the inspection process, computerise the results of individual interventions, and feed these data into existing electronic, online monitoring systems. This will help to shorten inspection and repair cycles by enabling more precise, targeted planning. The RepaKorr project is funded by the German Federal Ministry of Education and Research and coordinated by Muehlhan AG. In this project, manufacturers of coating materials, specialists in the application of coating systems, wind farm operators, constructors of steel structures and industrial safety experts are combining their expertise in materials science, engineering, system design and organisation to lay the ground for a new onsite repair concept.